Worked at Bing for long enough to be very familar with the presentaion of things like stock quotes (my answer 🙂 ), images, news etc. My vote was very biased. Fortunately or unfortunately my Bing habbit continues! I liked this. 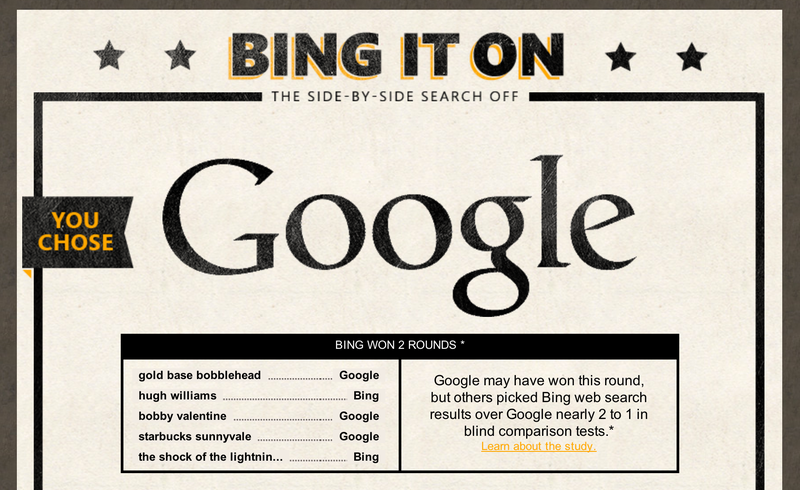 Google won 4 out of 5, and the one Bing won was almost a toss-up. But the interesting part of this game for me (as a tester) was two-fold: 1) how we choose the search strings to test and 2) the criteria we use to judge which engine did it better. To me it’s a microcosm of two important skills testers must hone to reveal and report important bugs in software. As much as I wanted Bing to win, it was 3-1-1 in favor of Google :(. If anything, it seemed to me that the gap between Bing & Google has actually widened (both relevance & presentation) in the last two years. cqf verus mfe	Google (Even though both algo 1 and algo 2 are same, Deeplinks + result annotations make Google look a lot more relevant). Seems like Bing needs to work a bit on handling technical queries better. My favorite query is flight search. Try “ua 237”. Google wins hands down both on presentation and level of detail on the search page. It was a draw in my case. Though Google became a habit, I will consciously try using both from now on! Competition is good! 🙂 And, thank you for the post!